Valiant Thor reveals his Identity here on Earth!!! Wow!! Bottom line: It’s on. The new world order is making its move – it’s final stand – because it has to. They can’t keep up with the “music of the spheres,” and the solar-lunar year of re-calibrating human conscious is beginning to close. We recognize the grand drama happening at higher levels of consciousness, and remain fearless with the understanding that sanity and value for life returns. Sound Healing Fundraiser: Coupon Code: diamonds31 30% any music on Ted’s website “ A portion of the proceeds are going to DiDiamondsForever31 Blog Site & Radio Show!” www.tedwinslow.com: you will here the music at end of the video below. An Introduction to Diamonds Network: A Mainstream Media station and MORe!!!! Like what EarthSky offers? Sign up for our free daily newsletter today! Mercury moves from evening to morning sky. Mercury is at the tail end of a fine evening apparition for the Northern Hemisphere. Because Mercury reaches perihelion – its nearest point to the sun – on January 8, that means the solar system’s innermost and swiftest planet is speeding up all the more. It’ll pass in between the Earth and sun on January 14, to transition over to the morning sky. This world will become visible in the eastern sky before sunrise, starting around January 20. 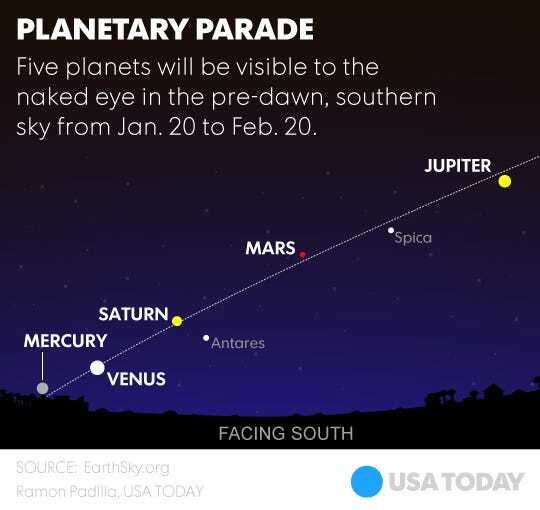 Once Mercury enters into the morning sky, it’ll join up with the other four morning planets – Jupiter, Mars, Venus and Saturn – to feature the first appearance of all five visible planets in the same sky since the year 2005. 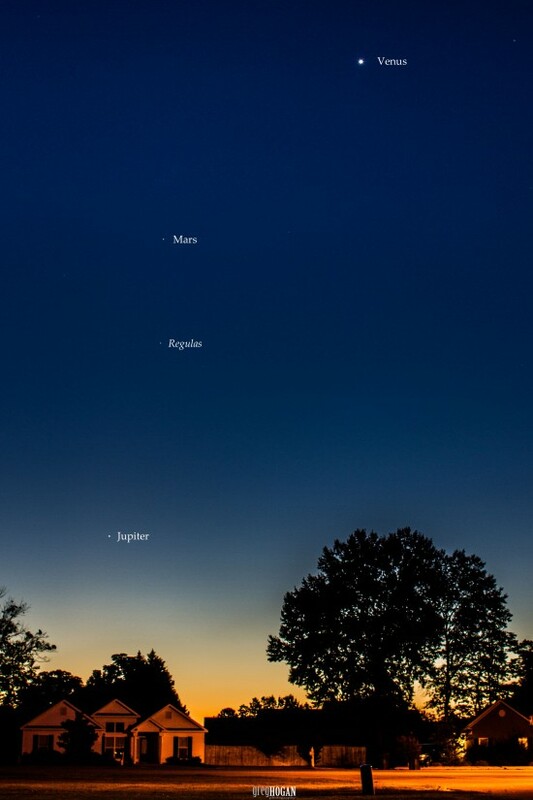 Look for all five visible planets to adorn the predawn/dawn sky from aboutJanuary 20 to February 20, 2016! We expect people from both Earth’s Northern and Southern Hemispheres to see Mercury with relative ease by around January 25. Mercury will be at its best in the morning sky for several weeks, centered around February 7, 2016. At this juncture, Mercury rises about 80 minutes before the sun at mid-northern latitudes. At temperate latitudes in the Southern Hemisphere, Mercury rises a whopping two hours (120 minutes) before sunrise. As always, no matter where you live, binoculars help out with any Mercury quest. Although Mercury’s upcoming morning apparition will be a good one for both the Northern and Southern Hemispheres, it definitely favors the Southern Hemisphere. Mercury might be visible for the whole month of February, 2016 in the Southern Hemisphere. 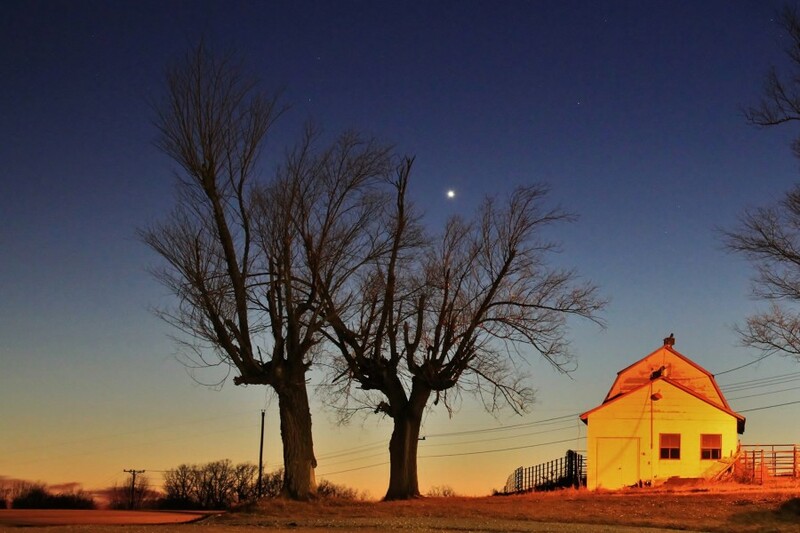 After a lengthy apparition in the morning sky, Mercury will finally swing back into the evening sky on March 23, 2016. Watch the waning crescent moon swing by Venus, Saturn and Antares over the next few days. The green line highlights the ecliptic – Earth’s orbital plane projected onto the great dome of sky. So step outside some early morning, and look in your southeast sky. You’ll surely see Venus shining there. It’s the third-brightest celestial body to adorn the heavens, after the sun and moon. 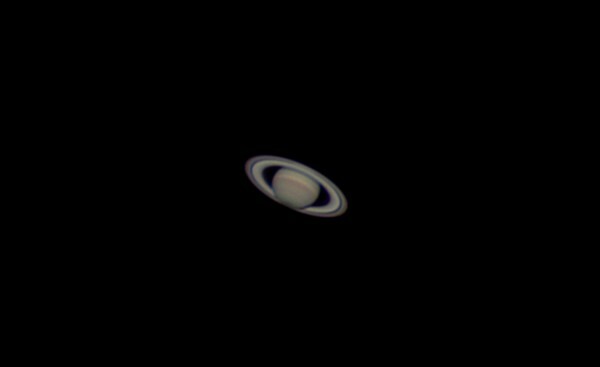 Use this dazzling world to find the fainter planet Saturn, as these two worlds will be quite close together on the sky’s dome for the first half of January 2016. In fact, Venus and Saturn will stage a particularly close conjunction before sunrise on Saturday, January 9. Circle that date on your calendar! 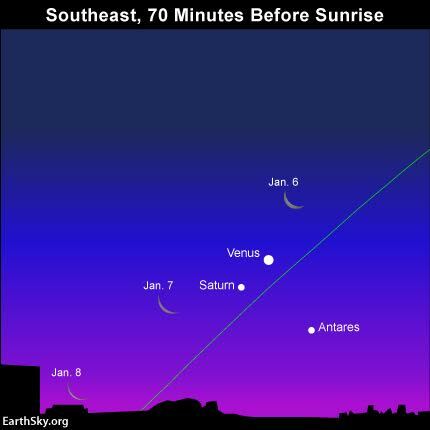 Watch for the waning crescent moon to swing close to Venus (and Saturn) before sunrise on January 6 and January 7. See the sky chart above. 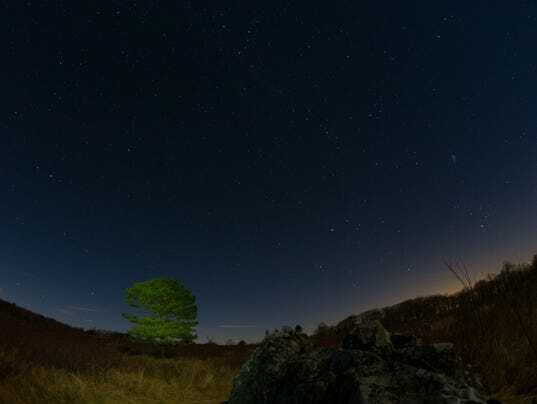 You won’t want to miss Venus and the other early morning planets – Saturn, Mars and Jupiter – which adorn the predawn sky all month long. 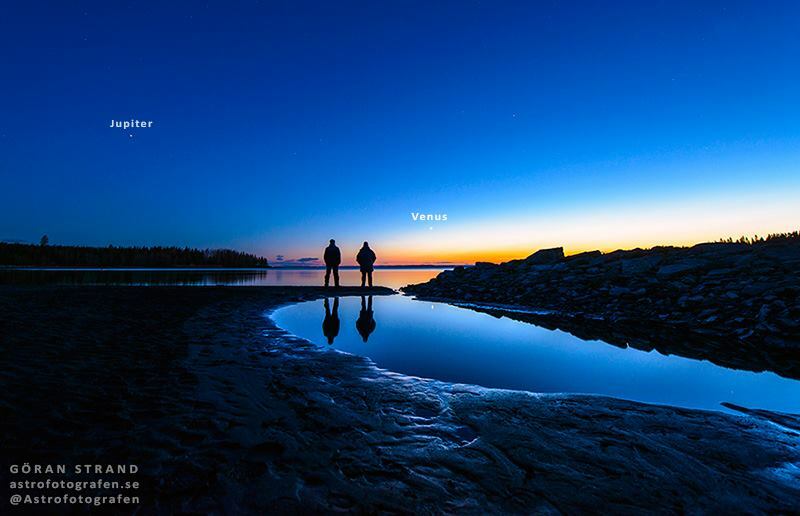 At mid-northern latitudes, Venus rises about three hours before the sun at the beginning of the month, tapering to about two hours before sunrise by the month’s end. Jupiter, second-brightest planet, high before sunrise. Jupiter is the first planet to appear in the sky, rising in the east before midnight local time at the beginning of the month. 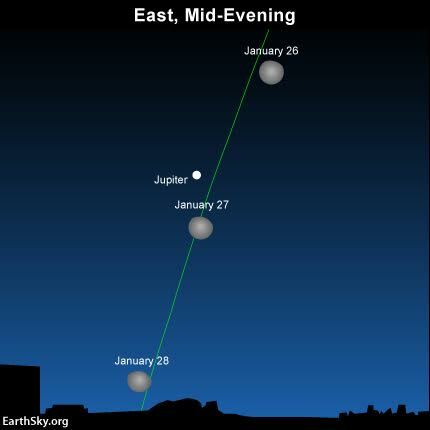 By the month’s end, Jupiter will actually rise around mid-evening (roughly 9 p.m. local time) from both the Northern and Southern Hemispheres. From around the world, the king planet Jupiter and the red planet Mars both shine respectably high in the January predawn sky. Much closer to the horizon, Saturn climbs above Venus by around January 10, and Mercury joins the procession of morning planets in late January. The waning crescent moon shines close to Jupiter on the mornings of Janaury 26 and January 27. Although Jupiter’s axial tilt is only 3o out of perpendicular relative to the ecliptic (Earth’s orbital plane), Jupiter’s axis will tilt enough toward the sun and Earth so that the farthest of these four moons, Callisto, will NOT pass in front of Jupiter or behind Jupiter for a period of about three years, starting in late 2016. During this approximate 3-year period, Callisto will remain “perpetually” visible, alternately swinging “above” and “below” Jupiter. 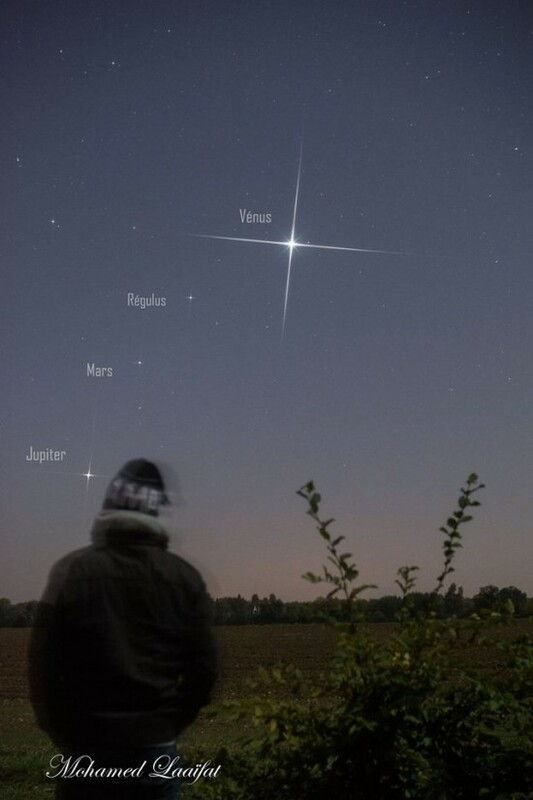 Mars shines between Venus and Jupiter. Mars is nowhere as bright as Venus or Jupiter. Even so, modestly-bright Mars is easily visible in the predawn sky. Mars shines in between Venus, the sky’s brightest planet, and Jupiter, the sky’s second-brightest, all month long. Although Mars will be fairly close to Spica, the brightest star in the constellation Virgo, you can distinguish Mars from Spica by color. Mars appears ruddy whereas Spica sparkles blue-white. If have difficulty discerning color with the eye alone, try using binoculars. 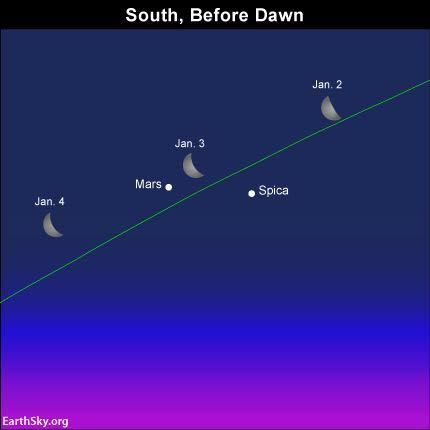 Let the waning crescent moon help guide your eye to Mars in the morning sky on January 2, 3 and 4, as shown on the above sky chart. Saturn, near Venus, visible before dawn. Saturn shines as a morning planet all through January. From around the world, the ringed planet starts the month rising roughly two hours before the sun. 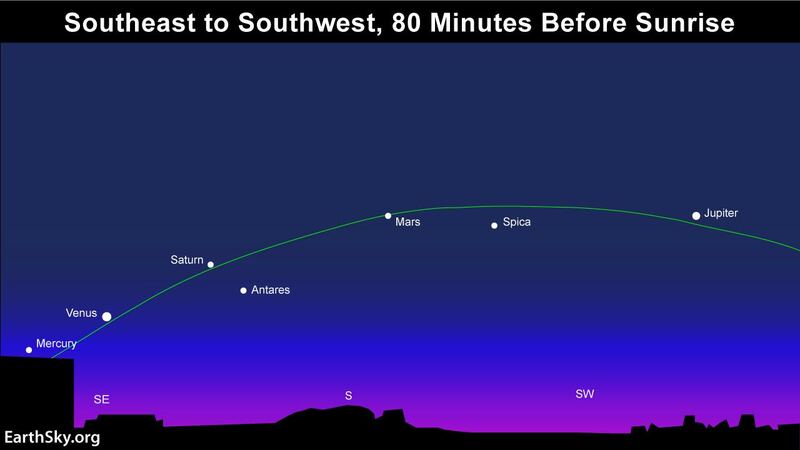 By the month’s end, Saturn rises close to four hours before sunrise. Use Venus, the sky’s brightest planet, to find Saturn. During the first week of January, Saturn will climb upward toward Venus in the morning sky, until these two worlds meet up for a close conjunction on January 9 – the closest coupling of two planets since March 22, 2013. After their conjunction, Saturn will continue to climb upward, while Venus sinks downward in the January morning sky. Saturn’s rings are inclined at about 26o from edge-on in January 2016, exhibiting their northern face. Next year, in October 2017, the rings will open most widely, displaying a maximum inclination of 27o. As with so much in space (and on Earth), the appearance of Saturn’s rings from Earth is cyclical. In the year 2025, the rings will appear edge-on as seen from Earth. After that, we’ll begin to see the south side of Saturn’s rings, to increase to a maximum inclination of 27o by May, 2032. What do we mean by visible planet? By visible planet, we mean any solar system planet that is easily visible without an optical aid and that has been watched by our ancestors since time immemorial. 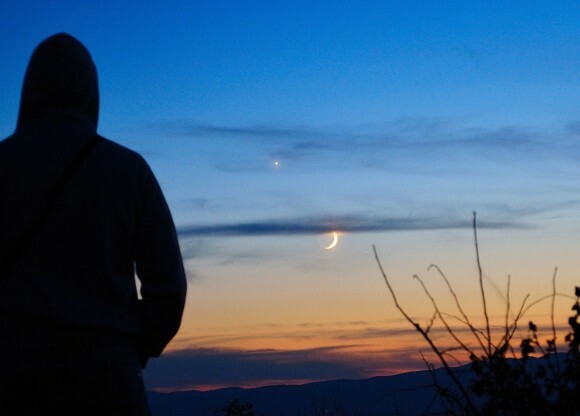 In their outward order from the sun, the five visible planets are Mercury, Venus, Mars, Jupiter and Saturn. These planets are visible in our sky because their disks reflect sunlight, and these relatively nearby worlds tend to shine with a steadier light than the distant, twinkling stars. They’re often bright! You can spot them, and come to know them as faithful friends, if you try. 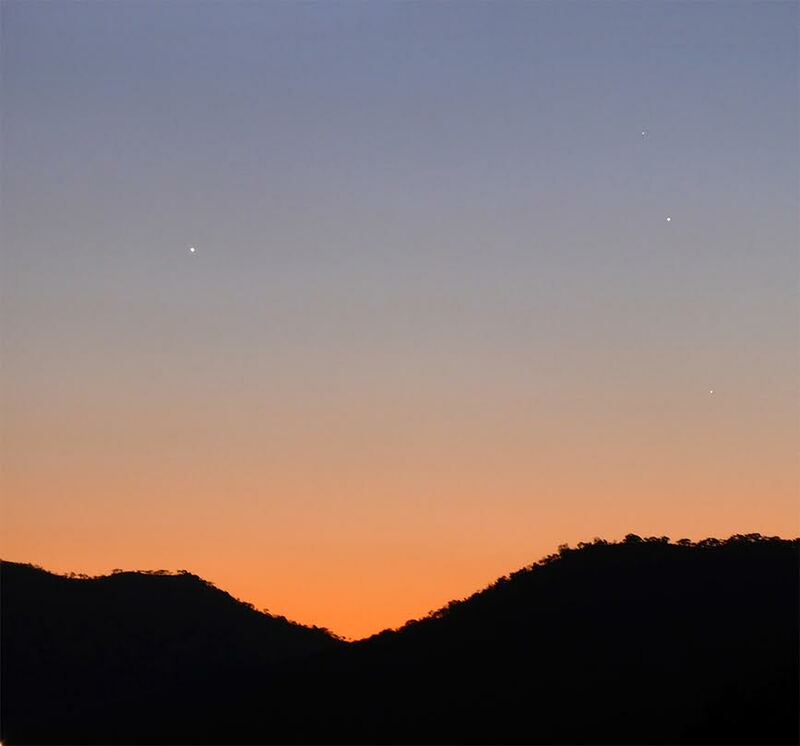 Bottom line: Saturn, Venus, Mars and Jupiter adorn the predawn/dawn sky all month long, with Saturn meeting up with Venus for a conjunction on January 9. Mercury joins the morning planets in the final week of January, to showcase all five visible planets in the same sky. Easily locate stars and constellations with EarthSky’s planisphere. WEDNESDAY Today!! Jan 20 2016 Diamonds Show LIve with Chris at 8:30pm Central. come join us!! 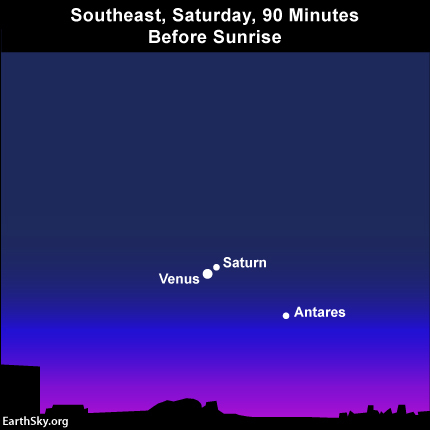 Awesome month for planets before dawn: October, 2015! Photo taken October 2, 2015 by Mohamed Laaifat Photographies in Normandy, France. Eastern sky before dawn now. 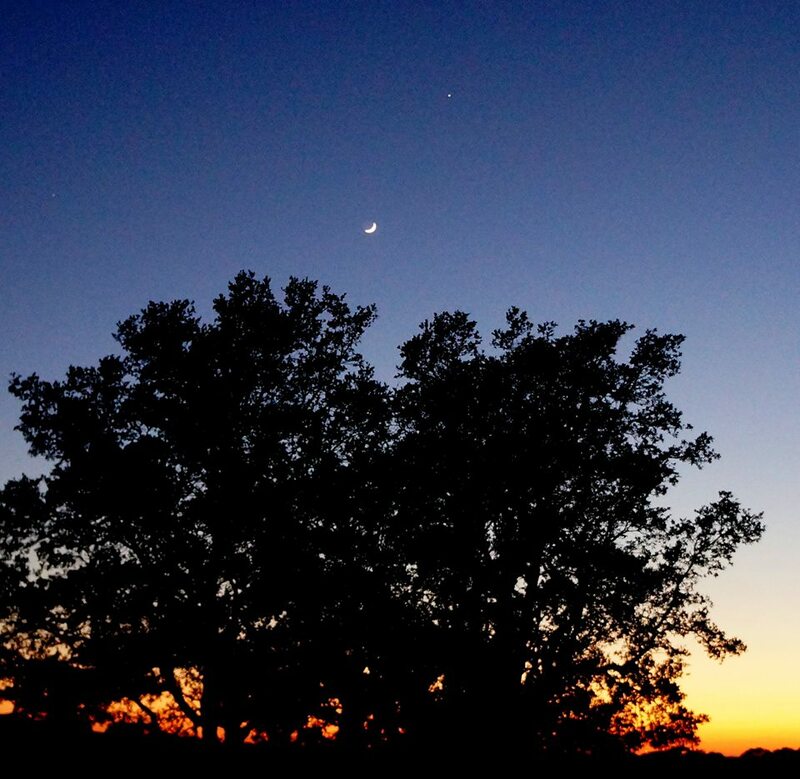 Photo taken September 18, 2015 and submitted to EarthSky by Greg Hogan in Kathleen, Georgia. Thanks, Greg! View larger. Evening dusk on August 5: Venus at left. Mercury is climbing higher, toward Regulus (at top) and Jupiter (beneath Regulus). 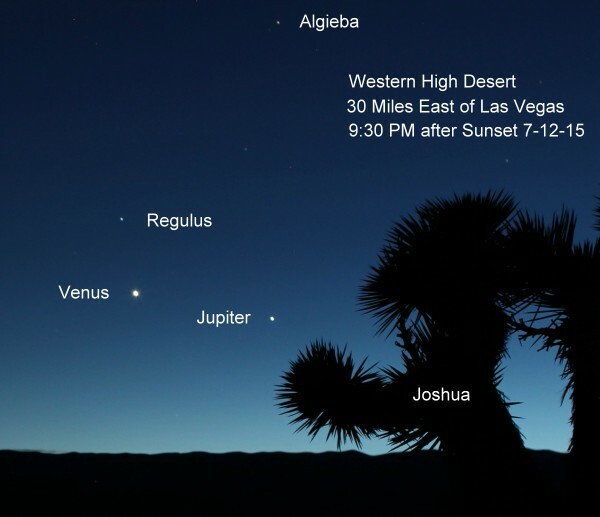 By the evening of July 12, Venus and Jupiter were farther apart and lower in the western sky after sunset. Photo by Robert Kelly. Thanks, Robert! Photo taken June 13, 2015 by John Nelson at Puget Sound, Washington. Thanks, John! View larger. | Photo taken in early June, 2015 by Göran Strand in Sweden. 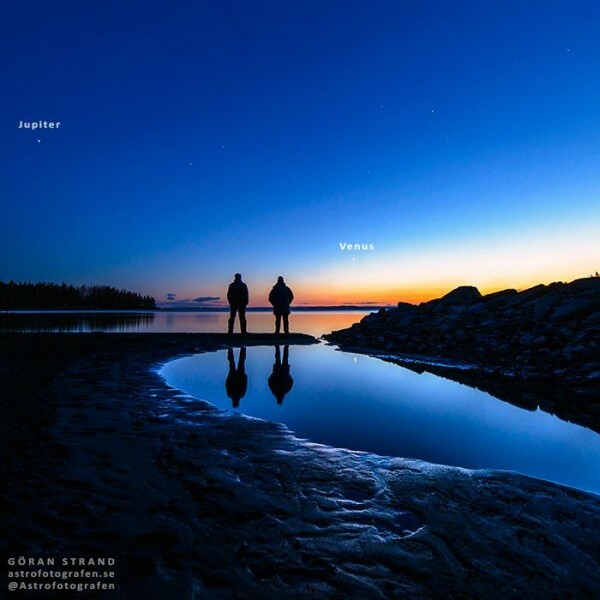 He wrote: “One of the last nights during the spring when the stars were still visible … ” Follow Fotograf Göran Strand on Facebook, or @astrofotografen on Instagram. Or visit his website. 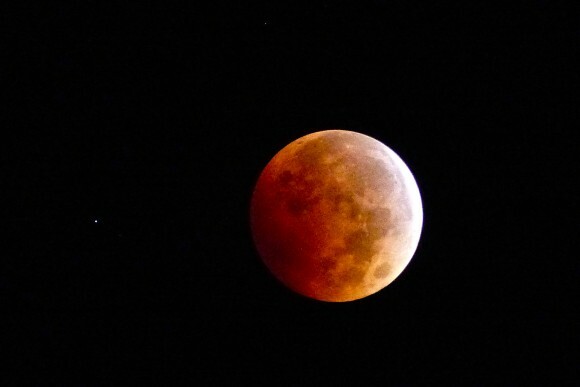 Lunar eclipse on the night of October 8, 2014. The object to the left is the planet Uranus! This beautiful photo is by Janey Wing Kenyon of Story, Wyoming. Debra Fryar in Calobreves, Texas captured this photo of the moon and Jupiter on May 31, 2014. Jupiter was close to the twilight then. 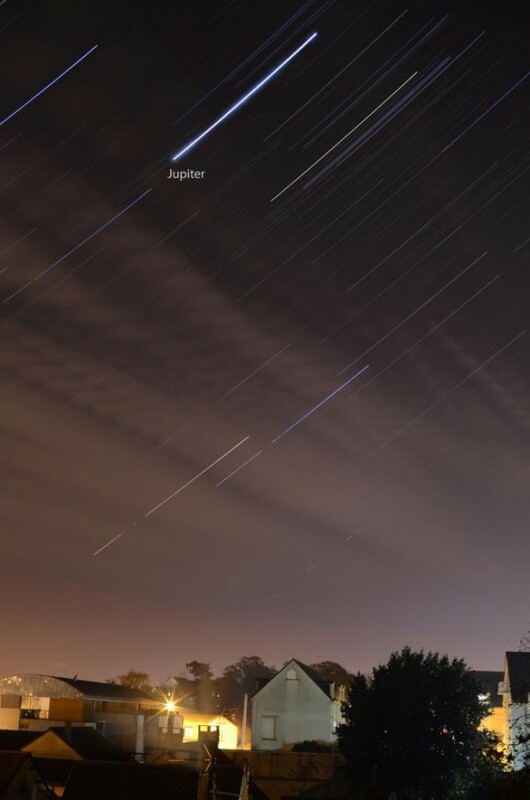 Jupiter was rivaling the streetlights, when Mohamed Laaifat Photographies captured this photo in Normandy, France. Visit his page on Facebook. These are called star trails. 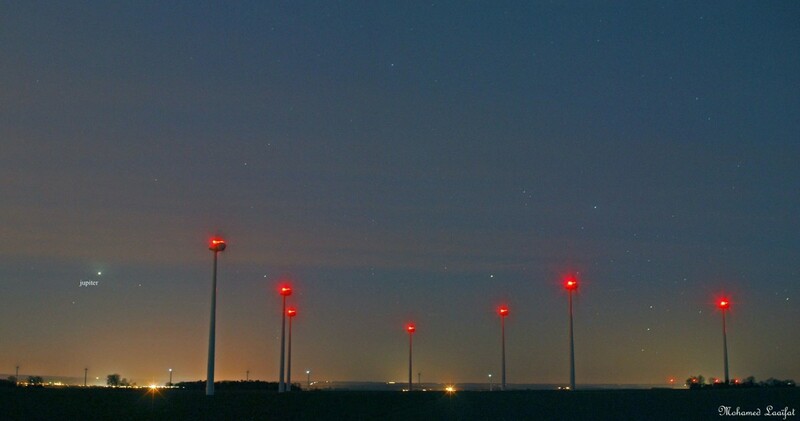 It’s a long-exposure photo, which shows you how Earth is turning under the stars. The brightest object here is Jupiter, which is the second-brightest planet, after Venus. This awesome photo by EarthSky Facebook friend Mohamed Laaifat in Normandy, France. Thank you, Mohamed.